Batavians choose not to live like they do in big cities. posted by Charlie Mallow in crime, Neighborhoods, NIC, decline. Make no mistake the natural instinct of someone in elected office is to gloss over the obvious decline in the quality life. If you’re in public office and you want to stay there, why would any rational person draw attention to the problems? It’s not an election year.. Besides if you draw attention to the problem and you are in office, you will then be expected to do something about the problem. That is how the system has worked for years. Inaction or denial by elected representatives has been the reason for decline in all our major cities. Batavia is a little different and so are its people. Batavians care about our quality of life and elected people who understand that there is a problem and are willing to do something about it. In this city, improving our neighborhoods is not a political issue. We are past the notion that there is a developing problem, we are on our way to looking for solutions. Last night’s Neighborhood Improvement meeting was another small step forward. Those meetings have become gatherings for landlords, volunteer groups, public officials and regular citizens to work together and find solutions to our small problems before they get bigger. Our acting police chief reported on a new program to help landlords protect their property and help police spot drug activity. City inspections reported over 800 letters being sent out for violations in the last month, more than double what we did all of last year. They also reported that almost 80% of the violations were taken care of quickly and how most property owners accept the letters as a reminder. There was a report on the success of the “helping hands” volunteer group with their work on Thorpe and Watson Streets over the weekend. Ideas were passed on for ways to educate the public, so that they can be more aware. With a little work and by people taking responsibility for the problems we have, Batavia will never be like Buffalo, Rochester or Chicago. Batavians choose not to live like they do in big cities. posted by Philip Anselmo in Batavia Players, GCC, Plays, acting, entertainment. Last night, I was fortunate enough to be invited behind the scenes for the Batavia Players' dress rehearsal of Come Back to the 5 and Dime, Jimmy Dean, Jimmy Dean, which premieres tonight (see showtime info below). As the cast members flitted this way and that, in and out of their dressing rooms, up and off the stage, I had just enough time to sit with Patrick Burk, the show's director, and a couple members of the cast. We chatted right up on the set — which Patrick later informed me is made up of no less than 400 props donated by several of the players themselves. Who: The Batavia Players: Valeria Antonetty, Shawnie Euren, Lynda Hodgins, Rachel Oshlag, Nikole Marone, Peggy Marone, Joan Meyer, Patti Michalak and Jake Bortle. Patrick Burk directs. What: Come Back to the 5 and Dime, Jimmy Dean, Jimmy Dean by Ed Graczyk. Where: Stuart Steiner Theater, Genesee Community College, Batavia. When: May 8, 9 and 10 at 7:30pm. Tickets: Available at Roxy's Music Store, 228 W. Main St., and Go Art!, 201 E. Main St. $10 for adults, $8 for senior. posted by Philip Anselmo in Richmond Memorial Library. "The Richmond Memorial Library Board of Trustees and staff wish to express our thanks to the voters of the Batavia City School District for approving our budget vote and electing a new trustee, Tracy Stokes, to the library board. "The increase in funding for 2008-2009 will allow the library to add a second full time custodian. This way we will have a custodian on duty at night and on the weekends, making our library building a safer destination for our patrons. Two other initiatives that will take place in 2008 and 2009 are: a new Web page for the library and a space study of our building. The new Web page will give each "department" of the library its own page (ex. children's, teens, media, adult readers). Pages will be updated more often and be more interactive, for example, allowing patrons to register for classes online. The space study will be done by a professional firm and will help the library to better utilize the space we have in a more efficient and attractive manner. We will also be looking at our parking situation in this space study, trying to add more handicapped spaces and short-term parking spots. I'd like to eventually see us add a drive-up book drop on the driver's side. "The newly adopted budget will also provide continued funding for books, media, and online resources. We will continue to update computers available for public use and maintain our wireless network. Wi-Fi is available on the main floor of the library. Programs for all ages will continue. "We will also be adding a fax for public use. Many people come into the library and ask if we have a fax available. Shortly we will. There will be a cost to fax, but the cost has not been decided upon yet." Thank you for the info, Diana. Best of luck. posted by Daniel Jones in Barack Obama, politics, Democrats, Young Democrats, Voting, Jon Powers, Registration, Michele Ianello. The Young Democrats will continue its Voter Registration drive tommorow at Genesee Community College (in the forum). If your 18, a citizen and aren't registered to vote (or have moved since you last registered) come on out now so you can register in time to vote in the general election. Although the Democrats are sponsering the event, we will not discriminate our registration on the basis of desire to register as an Independent or a Republican....we just want to see as many people registered (and voting!) as possible! I will be there all day tommorow, so if your aren't registered to vote, come on out! And even if you are, come say hi, we always love the company. posted by Philip Anselmo in Neighborhood Improvement Committee. Batavia's Neighborhood Improvement Committee will be meeting tonight at 6:30pm in the community room at City Hall. Their meetings are open to the public and anyone can speak at meetings. I couldn't get much information out of the city manager's office about what exactly the committee will cover tonight, but the city Web site says this about the group: "The Neighborhood Improvement Committee makes recommendations and develops strategies to enhance the quality of life within the city’s neighborhoods." This seemed like an apt notification following a conversation I had yesterday with Councilman Bob Bialkowski who cited neighborhood decline as one of the primary problems facing the city today. On a drive through parts of the city's southside — an area Bob pinpointed — I did not see much in dire decline, at least, not from the outside. But a comment from Daniel Cherry that afternoon seemed to indicate that maybe the problems were more internal. Quality of life is certainly an issue worth tackling. And the more people that get involved in that conversation, the more just and more worthwhile the discussion. posted by Howard B. Owens in awards, jaycees. It looks like the local Jaycees swept up quite a few awards on Saturday, according to Scott's JCI Blog. Scott Kinglsey of Saratoga Springs doesn't give any details on the awards banquet, but he runs down a complete list of honorees. Congratulations to all the winners. It sounds like Batavia is fortunate to have a strong Jaycee chapter. posted by Philip Anselmo in news, Daily News, headlines. • Congressional candidate Jack Davis stopped by Batavia yesterday, his "first 2008 public campaign appearance in Genesee County," according to reporter Roger Muehlig. Davis said he is for "protecting" Social Security, "protecting" jobs and "fixing" the economy, which he called a "simple solution." No mention in the article of how Davis would "fix" the economy. Might be an interesting question to ask him the next time he's in town. • No one showed up to the Batavia City School District budget hearing last night. A proposed "$39.4 million spending plan includes a tax decrease of about 2 percent," writes reporter Joanne Beck. Residents of the school district can vote on the budget from noon to 9:00pm May 20. Beck's article covers all the details — except where to vote. • A pair of articles on the front page detail the Richmond Memorial Library budget vote and the Genesee Country Farmers Market move to Batavia Downs, both of which were covered on The Batavian yesterday. • A Rainbow Preschool teacher returns to work after an investigation into allegations that he "inappropriately touched students" was discovered to be unfounded. "We have concluded with certainty that the allegations were unfounded," Kellie Spychalski, acting director of Arc of Orleans, operators of the school, told reporter Scott DeSmit. • The Batavia Youth Bureau will be running a summer recreation program for kids (6-14 years old) from July 7 to August 15 at several city parks. Call (585) 345-6420 for more information. Or stop by an open house June 26 at Lambert Park on Richmond Avenue to register your child. • Four students from Genesee Community College were honored with the State University of New York Chancellor's Award for Student Excellence. Congratulations Robin Whittington, Kevin Nadrowski, Velicia Steward and Michelle Nichols. • Batavia High School senior Sabrina Twardowski won this year's Congressional Art Competition for the 26th Congressional district. Her pencil drawing — "Hands Holding Globe" — will be displayed in the Cannon House Tunnel of the U.S. Capitol. posted by Patrick D. Burk in Jimmy Dean, Community Theater, Our Town. During this same weekend, the Batavia Players will be presenting "Come Back to the 5 & Dime, Jimmy Dean, Jimmy Dean". It is another slice of Americana that takes place in 1955 Texas during the filming of the movie "Giant" and again in 1975. A beautifully scripted play with an incredible story line and fresh and exciting characters. It is no wonder that the likes of Kathy Bates, Karen Black, Sandy Dennis, Sudie Bond and Cher were featured in the Broadway version and that the movie Directed by Robert Altman became a cult classic. I am fortunate to be directing nine incredible local actors who shine in this production. Valeria Antonetty, Shawnie Euren, Lynda Hodgins, Peggy Marone, Nikole Marone, Joan Meyer, Patti Michalak and Rachel Oshlag perform thier roles with familiarity and grace. Working on these colorful and complex characters is not easy.....IT is exhausting and you will be very impressed by thier efforts. Oh...we can not forget the great job the one male in the cast.....Jake Bortle, a freshman from LeRoy Central School, is doing. I was so lucky to find these 9 gracious actors to be in this production. Jimmy Dean, Jimmy Dean is this Thursday, May 8th through Saturday, May 10th at the Stuart Steiner Theater, Genesee Community College....7:30PM. Tickets are $10 General Admission and $8 Seniors/Students. I guarantee you will enjoy this show. The Batavia Players are reminding everyone that it is PG-13 in nature and may not be suitable for younger audiences. So what can I say??? How great is it that we live in this small city with Classic Theater offerings like we have this weekend. How wonderful for those of us in the arts, that we have the support of our community and residents. How proud can I be as a Dad when my daughters and I both have shows on the same weekend. Make this a special week and see both shows.... We appreciate your support. posted by Howard B. Owens in Brothers International Food Corp., Brothers All Natural, potato chips, snacks. Batavia-based Brothers International Food Corp. has hit the national wires today because of a new potato chip that is supposedly tasty, addictive and fat-free. The chips are made by peeling, slicing and cooking the potatoes, then freezedrying them. The latter half of the process removes the moisture from the potato, leaving it crispy, light and satisfying. More information available on BrothersAllNatural.com. It sounds like a taste-test is in order. posted by Howard B. Owens in Genesee Community College, notre dame high school. Genesee Community College is hosting a conference on instructional technology. Notre Dame High School holds its annual 500 Club Dinner and Roast on May 29 at the Holiday in. More information on this PDF. Saturday, May 10th @ 9:00 a.m. - Cafeteria Stop by to Meet & Chat with our new high school principal, Mr. Christopher Dailey. All parents are welcome and there is no special agenda. While looking for school news, this picture of the 1925-26 Batavia High School basketball team popped up in Google search. posted by Philip Anselmo in news, video. Not much Batavia news out on the Internet this morning. Not in Rochester sources, not in Buffalo sources, not on WBTA Batavia radio — which has a brief about the library budget (we posted results last night), plus a few out-of-area briefs and the vows of a Congressional candidate not to be greedy. So yeah, not much. That means it's a great opportunity for you to make the news. I will not be hanging at Main Street Coffee until later today, in the afternoon. But that doesn't mean you can't just write a blog post about what's going on in your life, neighborhood, city, home, school... Or give me a call (585) 802-3032, and tell me the story and I'll do all the grunt work for you. That's about it for now. Look for some video later tonight and hopefully some more in the morning. In the meantime, hone your own journalistic skills and file a report. If it's news to you, it's likely news to the rest of us, too. posted by Philip Anselmo in budget, library. Voters passed the Richmond Memorial Library budget tonight. The results were: 245 votes in favor, 54 against. The total budget is about $1.15 million — about $40,000 more than last year. Also, library Board member Tracy Stokes was elected to a five-year term with a total of 284 votes. posted by Philip Anselmo in city council, Neighborhoods. After a chat with City Councilman Bob Bialkowski this morning, I went in search of the "pockets of decline" that he mentioned. Bob said to check out the southside of the city around Jackson, Maple and Thorpe streets, if I wanted to find the "problem" neighborhoods. That was where I thought to find the trash and debris, the buckled-under homes and general malaise. Not so. At least not by this city boy's estimation. I've seen streets in Rochester, streets in Buffalo, New York, Chicago, even some in Canandaigua that would make those Batavia blocks look like paradise on high, like a stroll through Green Acres. At the very worst, I spotted some peeling paint, a couple (maybe) ramshackle porches, a stray tricycle or two, a leaf-swollen gutter — maybe. But really, what I saw as I drove down Dawson Place, Ganson Avenue and Thorpe Street were people. What I saw were people outside, sitting on their stoops, walking their sidewalks, talking to each other, mowing their lawns. I saw a community. 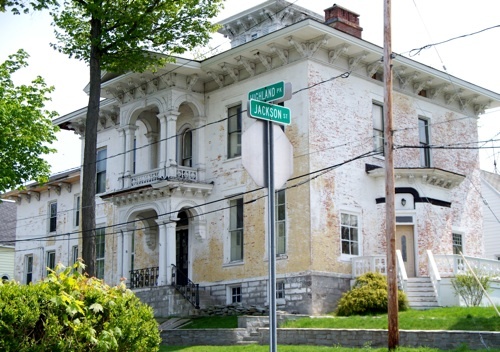 I saw regal, Victorian-looking homes, a little bruised, sure, but not broken, not even bent. So, maybe I wasn't looking in the right place. Maybe I wasn't looking with enough intent — I should say I was driving my car. Maybe those homes are rotten and rotting from the inside, really putrid and crumbling, which could explain why everyone was outside, hanging out. Or maybe — and this may be closer to the truth — maybe some Batavians have unusually high standards, higher standards than I have ever cultivated myself. What do you think of these (and other) neighborhoods in the city? Are they in decline? Are they run down? Do you live there? Is that how you see it? Is Councilman Bialkowski on the ball? Or is he over the top? • Reporter Tom Rivers works in the field — literally — as part of a series of articles on farm labor that kicked off today. His first stop: Triple G Farms in Barre. It doesn't take long for Rivers to realize he can't quite keep up with the crew of Mexican laborers. "I couldn't help but rub my back, shake my arms and legs loose, grit my teeth, and pray for rain, especially after a five-hour stint Wednesday." A fine article, worth checking out. • Seventy school representatives from across the country have been touring Batavia's city schools over the past few days as part of the National School Boards Association (NSBA) Technology Tour. • A story on page three covers the city cleanup effort initiated by Helping Hands this past Saturday. Charlie Mallow covered the event for The Batavian three days ago. Go here for his post. • The Genesee County Agricultural Society is looking for ways to boost attendance to the county fair — July 15-19 this year. Some of the ideas: move midway rides closer to the center of the fair and include more in the ticket price (so that $5 can get you access Tuesday and Wednesday, for example). What would get you to the fair? posted by Patrick D. Burk in Spring, Lawns, Mowers, Yard Work, House Chores. My thoughts came to rest the other day....Sunday, the day that the lawn people showed up. I would like to say finally, but that would mean I was sensing some sort of impatience...and I wasn't. It is always a great sign of spring and nice weather when I stop worrying how to get all the winter sludge and branches out of the yard and the lawn raked and the grass seed spread before the neighbors and my wife start to complain. She had already made a foray into the yard to pick up sticks, the proverbial "hidden under the snow garbage" and other messes that winter covers. I did a cursory once around as well....but when the lawn people show up.... I feel a certain sense of ease and comfort. It is then that I know that I am freed from my cares and woes. I never mow or rake...I let the experienced men do that. I let the lawn people do it. Just think, what other profession do we do ourselves that entitles pushing a heavy machine around while giant blades spin inches away from your appendages. There are none. Why I day dream so much that the neighbors indeed should be frightened if they ever see me pushing a lawn mower.... I would become public enemy number one. Safety of pets and animals would be in jeopardy. Could you imagine if I had the chance to drive one? There could be a whole series of horror movies written about my exploits...I can see it now "Lawnmower Man's Revenge", Lawnmower Man's Revenge II"....just keep going and going...and.... Now to make matters even more difficult are the neighbors who mow thier lawn a certain way so that it looks nice and green and groomed. If I want nice and green and groomed I'll take up that game with pockets and balls played on a table or just continue to play golf badly and more often. I can't compete with green and groomed? I am just lucky it does not look like cow pasture. My lawn people take care of that. We have had the same lawn people for quite some time. They are two local kids....I actually have known them since birth. Now I trust them with powerful machines with whirling razor blades and wheels because they are the professionals....they have the knowledge...they have been doing this thier whole life. It is a family business.... green and groomed is in thier family....cow pastures are in mine. So they showed up and started to work. I made my appearance outside and pointed to a couple of areas of my concern (just so that they don't think I am totally detached and uncaring) and smiled, shook thier hands and thanked them once again for bringing to me that certain peace of mind. Lawn worries can go away. ....Yawn.... Time for a long summer's nap.... AND THEN IT HAPPENS.... "You know Patrick", she says as my eyes are almost to a thin slit of slumber...."We need to paint the house this year!" DANG....More worries....... the mind starts to whirl...paint...I hate to paint...I don't paint.... I sit and read and have fun and....and...... Well who knows. Hey.... Maybe the lawn people paint? There....that is better...Time for a nap....Eyes shut..... Ah peace again. I've still had no luck catching the city manager or police lieutenant — both very busy men, it would seem. Must be tough business running a city and keeping it safe. I wouldn't doubt it. Fortunately, City Councilman Bob Bialkowski got back to me. We had a chat this morning about his thoughts on what's going on in the city these days. Bob's a former crop-dusting pilot, "semi-retired" now, he says. That means he has "only one" airplane, from which he does aerial photography — his current business. He's been flying since he was a kid. On his Web site bio, Bob mentions "community improvement" under his special interests. So I thought I'd ask him about that. So I ask him, quite simply: what needs to be improved, and how do we improve it? "We've got some pockets of decline," he says. "We have to change some of our zoning laws, change code enforcement. We need to try to improve these areas." That means public education on how to properly dispose of yard waste, for example. Get the word out to people, whether it's through the newspaper, through our site, in pamphlets included with the water bill — people need to be more aware, says Bob. He says that "entire neighborhoods are a problem — trash all over, abandoned cars in the back yard." Head over to the southside of the city, to Jackson Street, over near Watson and Thorpe streets, State Street, and you'll see what he's talking about. "But you can pick any street," he says. Meanwhile, he goes on, the city has a tough time keeping up with all the violators. The code enforcement staff is minimal. Absentee landlords know how to work the system to "avoid" making the necessary improvements for "four or five months" at a stretch. Add to that the increasing crime rate — Bialkowski says the city department is 300 calls above their total for this time last year, which set records itself — and you've got a situation that could get out of control fast. Nor is that all. Bob also takes issue with the taxes. They're too high, he says. "Every year, more property in the city gets taken off the tax roll because of non-profits and tax exempts," he says. "And they use city services. They put their trash out by the street for pickup, but they don't pay for it." In many ways, that's a valid claim, says City Assessor Michael Cleveland, who estimates the tax exempt properties in the city to total about 30 percent, without looking at the tax rolls. You have to understand, however, that Batavia is a county seat, he says. As the hub of Genesee County it's going to get the churches, the county offices, the organizations, all those who are tax exempt. Could that just be the price of convenience then? posted by Philip Anselmo in batavia, Batavia Downs, farmers market, produce. Not homeless for long, the Genesee Country Farmers Market signed a contract with Batavia Downs to set up shop in its parking lot for the summer season. The market was told by Kmart a couple weeks ago that it could no longer use its parking lot, which had been home for the farmers for about a decade. Offers to host the market poured in from all over the community — and some towns nearby. "We were probably offered every parking lot in Batavia," says Paul Fenton, the market's director. "We had a ton of input on this. The community support was tremendous." In the end, Batavia Downs, at 8315 Park Road, offered the market the best deal — proximity to the old site and a vigorous promotional backer. The market will be open from 8:00am to 5:00pm starting June 10 and closing for the season on October 31. Says Fenton: "You'll see a lot more promotional stuff, a lot more giveaways. We're going to double our giveaways. And the Downs will help us with a few of those things." Call (585) 343-9491 for more information. posted by Howard B. Owens in restaurants, Pok-A-Dot. This morning, breakfast at the Pok-A-Dot. True greasy spoons are treasured finds these days. The Pok-A-Dot is a classic. From the moment I walked in, I could see the crowded counter was full of local residents who probably had been coming there for years. As I saddled up on an empty stool, I quickly observed -- no printed menus. Speedy decision, go for the safe, sure-to-serve choice to save fumbling over options and giving myself away as a first-timer (as if that wasn't obvious from the get-go), so I went for coffee, eggs, sausage, hash browns and toast. A word about the coffee: It will wake you up in the early morning. The young ladies cooking and serving the food were friendly and knew everybody in the joint but me. The conversation was personal and never touched on anything more weighty than whether to pick the chocolate or glazed donut. It made for a relaxing meal. As I've written before, Batavia benefits from an abundance of dining establishments. My goal: To try them all. Any suggestions for lunch today? Meanwhile, Philip and I will be spending the better part of today hanging out at Main Street Coffee (our permanent office is near ready). If you stop by, please be sure to say hello, and the coffee will be on us. 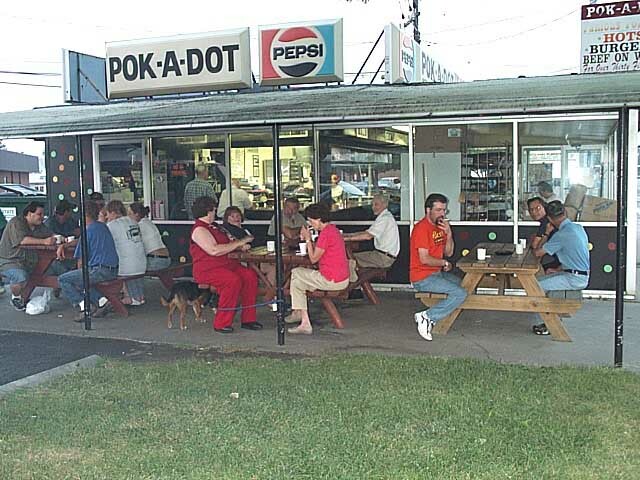 UPDATE: Using Google Image search to see if there were any pictures of the Pok-A-Dot floating around on the Web, I found "The Cyber Pok-A-Dot," a large collection of photos of Pok-A-Dot customers. Very cool. posted by Philip Anselmo in batavia, Democrats, Jon Powers, Iraq. The Genesee County Democratic Committee will host Jon Powers, an Iraq War veteran and Democratic candidate for the 26th Congressional district, for an airing of the documentary, Gunner Palace, at 6:00pm Monday (May 12) at the Elks Club, 213 Main St., Batavia. Gunner Palace is a film based on the 2/3 Field Artillery unit that Powers served with in Iraq. Following the movie, there will be a question and answer session with Powers. The cost is $25 for adults, $10 for students and free for any veteran wishing to attend.